RNP’s Advanced Internet Program seeks to introduce, in the organization’s offers, the typical services and functionalities of the world’s most advanced academic networks. Such practice began in the 00s, after the concept of hybrid network, which appeared in the Netherlands, at academic network Surfnet, in 2001. At that time, the initiatives to carry out experimental activities in network environments led RNP to invest in Advanced Internet applications, which demanded a large bandwidth. The provisioning for lightpaths in IP networks to facilitate and improve data exchange was used for the first time at RNP in 2007, for a good-quality video broadcast between Brazil and Spain. From then on, the adoption of a hybrid architecture became a central element of the RedeH-Advanced Internet project, which made a technology prospecting for the adoption of a hybrid architecture in the sixth generation of the national backbone, in 2011, christened CIPÓ. RNP has also been a member, since 2008, of Global Lambda Integrated Facility (GLIF), an international collaboration among teaching and research networks that share optic transmission and commutation resources, in order to develop and demonstrate the forwarding of traffic through lightpaths. The creation of GLIF in 2003 was the international extension of the concepts of hybrid network and lightpaths, allowing the interconnection of hybrid networks in different countries. RNP has operated, since 2011, the Dynamically Provisioned Circuits Service (Cipó), which brought to the academic network the necessary characteristics for it to work as a DCN (Dynamic Circuit Network). Such infrastructure allows the automated configuration of short or long duration lightpaths between two points, in a same network domain or in different domains. The development and implementation of a dynamic circuit provisioning service are premises that allowed RNP to operate a hybrid network, where the advanced scientific application data flow, separated from the general Internet traffic and transported through IP routing, starts to be transported through lightpaths. That prevents jammed paths and seeks to optimize data transportation with greater efficiency. Physics, high energy, astronomy, meteorology and ultra-high definition video broadcasting applications are some examples of advanced scientific applications that need to move large volumes of data. MonIPÊ is RNP’s monitoring service, able to accurately measure the quality between lightpath IP networks. The tool allows network performance assessments in collaboration environments and supports the best use of the academic network by the institutions connected to the Ipê network. For it allows the performance of unidirectional and bidirectional delay measurements, loss of packages and outflow in several approaches, comprising the whole Ipê network, from the backbone to the last mile connectivity. The MonIPÊ tools are compatible with the perfSONAR standard and its main benefits include the management of the measurement points, for storage, scheduling and viewing of the measurement results. With different costs, benefits and software and hardware infrastructures, RNP provides several measurement kits, to meet the needs of both the academic institutions and RNP’s Points of Presence, as well as the international and laboratory measurements. MonIPÊ was developed in an open and flexible manner, with support to certain hardware platforms, to facilitate its implementation in client institutions. For last mile measurements, at RNP’s Points of Presence, points of measurement in servers are used, through low-cost hardware. For temporary connection measurements, that is, for on-demand use, MonIPÊ@Live is available, which is a portable measurement point in a USB flash drive. A hardware platform is still under development, for a point of measurement of a bandwidth of up to 10 Gb/s. Permanent: for an indeterminate term, the results of such measurements are stored for subsequent consultation and serve for long-term performance checks, supporting activities such as network resources capacity planning. Since 2004, RNP has been following up on the development of monitoring tools with North American networks ESnet and Internet2 and pan-European network GÉANT, through the perfSONAR consortium, of which it became a member in 2006, contributing for the collaborative development of monitoring tools. The perfSONAR consortium has an infrastructure for network performance monitoring that facilitates the solving of problems in lightpaths, the tracing of which crosses several networks. It has a service arrangement that allows performance monitoring in a federated environment. Such services are at an intermediate layer, between the monitoring tools and the diagnosis or viewing applications. The purpose of such layer is to collect and exchange measurement information between networks, using protocols agreed upon by the network communities involved. Science DMZ aims at studying and disseminating best campus network infrastructure practices for scientific application. Due to the growing volume of data that need to be transferred among the institutions, the campus networks need to adjust to such Advanced Internet reality. The network concept referred to as Science Demilitarized Zone (DMZ), or Science DMZ, was developed by North American Energy Sciences Network (ESnet). Its benefit is the optimization of the flow of data that must be transmitted, often through long-distance networks. Such transmissions may also benefit from services such as dynamically provisioned circuits, when available, for the temporary resources reservation in the advanced networks. In addition, the Science DMZ architecture also has a monitoring infrastructure based on the perfSONAR pattern and an optimized server for data transfers, the Data Transfer Node (DTN). As the Science DMZ environment is separated from the institution’s production network, the architecture may also be used to test new technologies that automate and offer differentiated network services, improving the user’s experience. An example of a Science DMZ use is a transfer greater than 1 terabyte between different countries or continents, which is usually not possible, in an efficient way, with the traditional network infrastructures. Research laboratories that generate large volume of data, university campus networks and RNP’s Points of Presence are the main parties that benefit from the program. The Collaboration and Viewing Dashboard is a part of the Advanced Applications and Remote Viewing program, kept by the RNP in partnership with the academic community. The high-definition tool allows the sharing of media and a greater interaction among the users in collaborative teaching and research activities. The equipment consists of a dashboard of specialised monitors (video-walls) controlled by a middleware called SAGE (Scalable Amplified Group Environment). Provided free by the universities of Hawai and Illinois, the middleware SAGE is a collaborative environment that enables local and remote users to access, view and share multiple content, in various resolutions, formats and from different sources. With scalability and ability to run several applications, the main utilities of the dashboard are viewing of complex data, simulations, temporal series, maps and high-resolution videos, during videoconference meetings and teaching activities. Currently, RNP coordinates the SAGE user community in Brazil, composed of 12 institutions that use the panel to assist their teaching and research activities. The project is carried out in partnership with the Polytechnic School of the University of Sao Paulo (LARC-PCS-EPUSP). The technical committees have been created to assist in the prospecting of new opportunities for research and development at the RNP. Each committee is headed by an academic researcher and relies on the participation of RNP’s academic researchers and collaborators. There are currently three technical committees, described below. 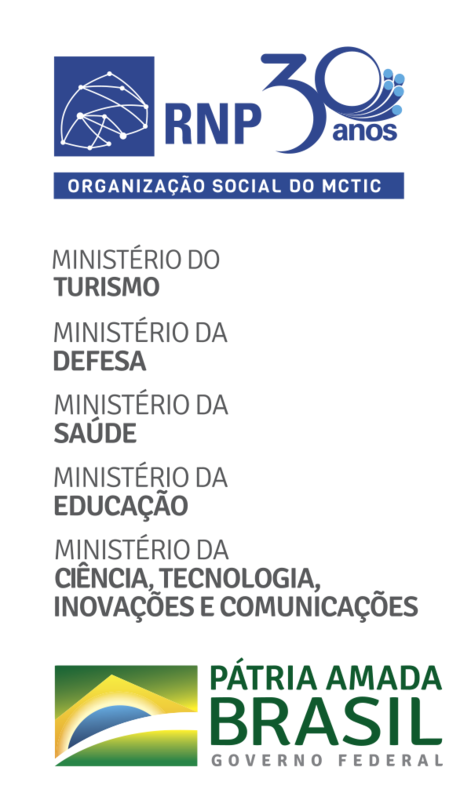 Due to the need to prospect technological updates in such subject, to align the Brazilian efforts to the worldwide scenario and to make sure that the MonIPÊ service is in agreement with the international initiatives, RNP created the Technical Committee in Network Monitoring (CT-MON), which is intended to follow-up on and collaborate with the evolution of the perfSONAR patterns. The lightpath performance is a constant topic of appraisal by the CT-MON. Data transfer between distant institutions is still a challenge, due to limitations of protocols used in the Internet, such as TCP. In addition, one of the goals is still the study of new kinds of tools, other forms of measurement and new metrics to appraise the network performance. Initiatives from performance groups, such as eduPERT (GÉANT), are also of interest to the CT-MON. RNP currently provides two services connected to authentication and authorization: the Public Keys Infrastructure for Teaching and Research (ICPEdu) and the Federated Academic Community (CAFe). In order to follow-up on other projects in progress regarding the subject, the Identity Management Technical Committee (CT-GId) was created, with participants from RNP and the academic community, to support the evolution of the services offered through technological prospecting. Created in 2014, the Technical Committee of Video Collaboration (CT-Video) is intended to carry out technological prospecting of video and remote collaboration applications, contributing to the construction of technical views that guide new investments in R&D. The group, formed by representatives of the academic community and coordinated by RNP, analyzes trends involving video applications in telehealth, teaching, production, editing and audiovisual broadcasting, telepresence systems, holography, digital TV, among others. CT-Video is open to any researcher or laboratory developing interactive video applications.